Home › Art › Make Your Own “Bacon Roses” For Valentine’s Day! Recipes For Heart-Shaped Burgers And Love Sausages Too! A Delicious Day Of Love! Give The Ultimate Valentine’s Day Gift: Bacon Roses! Valentine’s Day is just around the corner, so it’s time to get shopping – for bacon! Here’s a way to say “I love you” this Valentine’s Day: with bacon roses! I’m not kidding: with so many people giving flowers, why not give a flower that tastes as good as it smells! And they are easy to make! OK, making these delicious, edible roses is actually pretty easy. You’ll need: bacon, fake flowers, a muffin tin, toothpicks and tinfoil. 1. Soak the toothpicks in water (this keeps them from charring in the oven). Grab the bacon out of the refrigerator. Line a muffin tin with foil. Turn the oven up to 400 degrees. 2. Roll the bacon to look like a rosebud, then stick two toothpicks in the bottom to hold it together. 3. Place the bacon rosebuds in the muffin spaces. The toothpicks should keep them from touching the bottom — you need that space for fat drippings. 4. Put the bacon in the oven. Cook 25-30 minutes. 5. Deconstruct the fake flowers. Pull the entire thing apart, get rid of the petals and put the stem back together. In the mood for love? 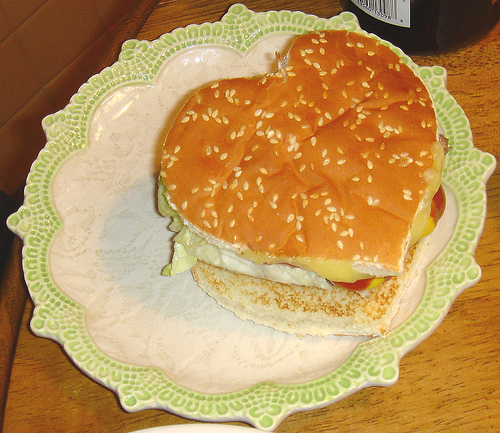 I thought so…and what better way to show it than this perfectly shaped Valentine’s Day burger, just one of many crazy things happening between buns today! Yes, it’s a nicely shaped sausage that says “I love you”, with what appears to be bacon wrapped around the sausage and an added bonus of two nicely baked eggs in the middle! 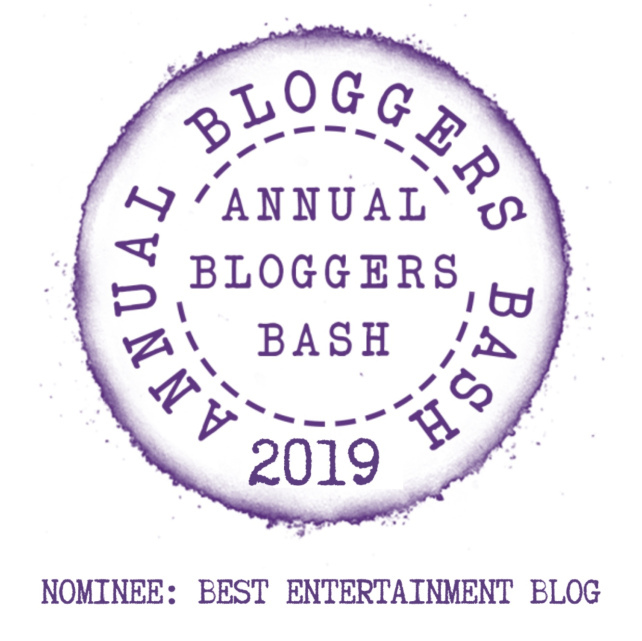 The terrific “Senior Salon” is celebrating Esme Slabs’ birthday by offering up a treasure trove of great Valentin;es Day blog posts – see it here and take part! ‹ Cult Movie Monday! “Single White Female” Packs A Punch! It’s “Crazy Roommate” Time! Love this idea and you can’t go wrong with bacon. Found you through Esme’s Senior Salon. Hope you check my site out. I will! Thank you for the comment! This is such a good idea, and so easy too, John. And there was me thinking ‘love sausages’ were a euphemism. I hate to admit it, but those bacon roses look damn good! They did that name on purpose but the food looks good! Perhaps a bit “niche” for most people, but a funny thing to show up with, that’s for sure! PS…my wife got a large floral bouquet, so she doesn’t have to worry about Valentine’s Day bacon! Strange and surprisingly beautiful! One of the best ways I’ve seen you showcase bacon, John. Thanks, Cindy! I can’t imagine them really taking off, but I do know a few people who wouldn’t mind receiving them! Thanks as always for the comment! Oh my word. I don’t think I would like to receive those – I would prefer the real thing. Well, they haven’t really taken off as “a thing” so you probably don’t have to worry!!! I am jealous I haven’t had this idea before you! This bacon roses are brilliant and hilarious at the same time! And I like the idea of real food for Valentine’s Day, not just chocolates and roses! Thanks for the comment! That’s a great point – it’s really just a artistically formed piece of bacon that is then cooked into that shape…tasty! Thanks for the comment! Main course, Beef Wellngton ( very small, and individual) with red wine sauce. Dessert, Coconut and passion fruit sundae. Red wine included, a bottle of Italian Pugliese. That sounds great Pete – with a bottle of wine included? Count me in!